A ray of morning sun hit the rockspray cotoneaster causing me to pause, grab the camera and head outside. It is a challenge to find interesting bits and pieces in a garden which has gone to sleep. We are fast approaching the shortest day of the year. There is a bit of fresh green on the hellebores and the buff of the grasses add interest to the minimalism of the garden. Most of the year the rockspray cotoneaster, Cotoneaster horizontalis, is overlooked in favor of the flowering shrubs and perennials but this shrub has backbone. The branching structure does look very similar to a boned fish. Rockspray cotoneaster has very small flowers which do attract bees (Note to self: make sure to get a picture of the flowers next year) but the subsequent berries which are quite prominent now, are red and borne in abundance. I did witness birds taking cover in the tight branching of this low growing, compact shrub. This is a very hardy shrub, hardy to Zone 4. It is said to be prone to insect infestations but I have not had an issue with it probably due to its open location in the rock border. Most of the year this plant goes unnoticed. This time of year, it is much appreciated. Finally a native spring flowering shrub. Well, native to the southeastern United States, that is. 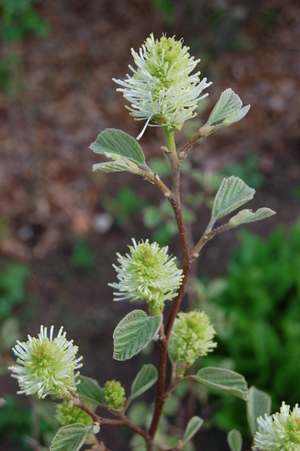 Fothergilla gardeneii is a tidy little shrub with white, fragrant flowers which are sufficiently different enough for the discerning eye to take note and pleasing enough to provoke the interest of the novice gardener. Creamy white is a better color description of this shrub which is in the Hamamelidaceae family. Its' optimum height is listed in Michael Dirr's Manuel of Woody Plants as three feet but I think it has already surpassed that height in my garden. If you are looking for an interesting shrub, hardy in zones 5-8, with lovely fall color, this might be a good choice for your garden. It fits well in the mixed shrub border being neat and tidy in habit. Mine is planted in a rather dry spot but its' natural habitat is at the edge of the bog. It will grow in partial shade to full sun. Flowering is heavier in full sun. I think it is a lovely little, well behaved shrub. Is there anyone else reading this who is growing the plant. What size is yours and do you find it interesting enough to recommend to other's? 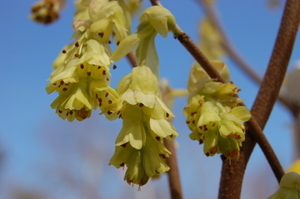 In addition to the witchhazels there are several interesting and underused species of winterhazel which include, Corylopsis pauciflora, the buttercup winterhazel ,and Corylopsis spicata, the spike winterhazel. Both are small shrubs with a spreading habits. The flowers open in April and care should be taken to site them in a sheltered location for protection from spring frosts. They prefer a moist, acid, soil in full sun or light shade and they are ideal shrubs for a woodland border. The C. pauciflora has smaller flowers than the C. spicata, as you can see from these photos. The flowers are a bit different and not the glaring yellow of many spring shrubs. C. pauciflora is hardy from zone 6 through 8. 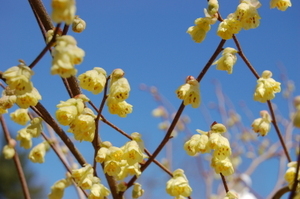 The C. spicata or spike winterhazel tends to spread wider than its height of 4' to 6'. It is hardy from zone 5 through 8 and is also the lovely primrose yellow of the pauciflora species. I think that they are both worth considering for a naturalized border. What do you think?